GrantStation is a premier provider of the tools and information nonprofit organizations need to win grant awards. 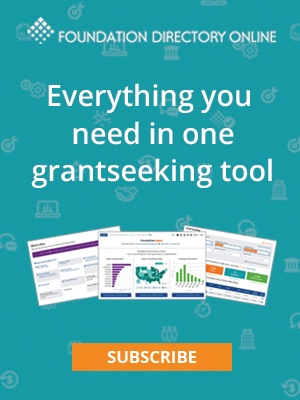 Find new funders in searchable databases, build strong grantseeking programs with strategic planning tools, and learn to write powerful proposals with step-by-step tutorials. The Grant Professionals Association (GPA) is the professional membership organization for individuals who work with grant funding in their organization. GPA members are responsible for the research, proposal development and submission, stewardship of grant funds, reporting of grant funding impact, and final closeout reporting for grants. GPA provides its members with the resources and tools to act ethically, efficiently, and effectively to support the funding needs of organizations. Foundation Directory Online (FDO) is everything you need in one fundraising tool. With interactive maps and charts, RFPs, and key funder and grants insights, FDO helps you to quickly identify funding sources, build your prospect network and win the funding to support your mission. Subscribe to FDO’s ever-growing source of 140,000+ funders, 12 million+ grants, and 700,000+ recipients today. Stanford Social Innovation Review is written by and for social change leaders from around the world and from all sectors of society—nonprofits, foundations, business, government, and engaged citizens. SSIR’s mission is to advance, educate, and inspire the field of social innovation by seeking out, cultivating, and disseminating the best in research- and practice-based knowledge. With print and online articles, webinars, conferences, podcasts, and more, SSIR bridges research, theory, and practice on a wide range of topics, including human rights, impact investing, and nonprofit business models. Wild Apricot helps thousands of nonprofits spend less time on administrative tasks, like processing payments and updating Excel files, and more time growing their membership. It's designed for volunteer-run and small staff organizations with a user-friendly back end so you don't have to be a technical genius to take your nonprofit to the next level. They also offer access to a community of peers and experts that share knowledge and best practices. In an era of global crisis and disconnection, we need new rituals that connect us. As the world's largest giving movement, GivingTuesday is spreading generosity across cultures and borders to create a healthy civil society. Through our groundbreaking #GivingTuesday Data Collaborative, we explore giving behaviors and patterns, movements, and altruistic behaviors more broadly, and identify and share the best practices that help grow generosity. NTEN creates a better world by supporting nonprofits in using technology to effectively meet their missions. Mission-driven organizations deserve a new way to get the resources they need to solve the world's toughest problems. Wethos people-powered technology curates teams of specialists in strategy, design, content, and more to service nonprofits in marketing/communications, fundraising, and development. By increasing capacity quickly with custom-made remote teams, organizations are able to amplify their mission and utilize expertise across disciplines, experiences, and passions.